Are your hedges overgrown and lost their shapes? If you do not have the time, the skills or the equipment to trim your hedges properly, call our company and hire our professional gardeners to give you a professional hedge trimming. You can rest assured that our skilled gardeners will trim your hedges neatly and bring their aesthetic look back. 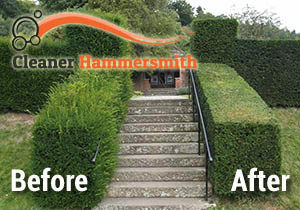 Our hedge trimming service is available in Hammersmith for residential and commercial customers. Be sure to call us soon. Our gardeners have been fully equipped with every hedge trimming machine and tool necessary to deal with any kind of hedges. 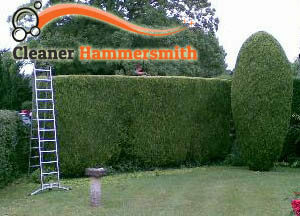 We can trim your hedges evenly and neatly no matter how many or how tall they are. Our gardeners are knowledgeable in the variety of hedge plants and their trimming and cutting needs and you can rest assured that our gardeners will trim your hedges when they need it and the way they should be trimmed. Our hedge trimming service is accessible to everyone from Hammersmith and the area and we assure you that your hedges will be in good hands. Our gardeners can trim your hedges perfectly, they use special hedge trimming machines that allow them to trim the highest hedges evenly as well. You can call our company at any time and book our hedge trimming service. We are flexible and we are always ready to help.